With the recent presentation in Europe of my novel “The Summer When God Was Sleeping”, which won the Internation Franz Kaka Prize for Novels from the Drawer, convened in the Czech Republic, and the resumé of awards which accompany me, you could think that I am a very lucky writer when it comes to awards, but this is very far from reality. I want to share and I’m sure that I once wrote this in another post, that if you could publish in Cuba, it was thanks to the competitions, which function as a form of blackmail, once won, it shows their moral and ethical responsibility, which I assure you that they do not have, but they like to pretend to the public, especially internationally, that they themselves do have moral and ethical responsibility, because my books were and are rejected out of hand as soon as they are presented to publishing houses. To me, they made it harder than anyone to get published. The editors and newsroom chiefs of these publishers, who maintain dialogues at book fairs as friends, confessed to me the impossibility of publishing them, precisely because of the topics addressed; if they did so they would be relieved of their jobs. Therefore, at different times, I was rejected from several news features, which were intended to show the different ways to approach the narrative by writers of my generation. My art was always accompanied by the themes of social deprivation and lack of political freedoms, so I was constantly an unprintable writer. I learned that winning the awards was the only possibility for me to address my failure to publish. Therefore in 1992, after I had been awarded the Casa de las Américas Prize, it was withdrawn thanks to the interference of State Security before the jury which retracted its vote, convinced that my human and slightly epic vision of the war of Cubans in Africa would create great political damage and it did not seem eloquent nor productive to present an image of those suffering soldiers that I outlined in my stories. After changing the title of the book, in an attempt to mislead the State security agents, who were like dogs sniffing the trail of my creations, I sent it to a contest of the Union of Writers and Artists of Cuba (UNEAC), and it was honored in 1995; but that wasn’t enough to get it published and for three years it would remain on the desk of the then President of UNEAC, Abel Prieto. After a dark negotiation, it was published in 1998, after I agreed to remove five stories from the final copy. They published a poor and ugly edition on purpose, which more closely resembled a box of detergent than a book and this was done with the purpose of weakening the book’s distribution. 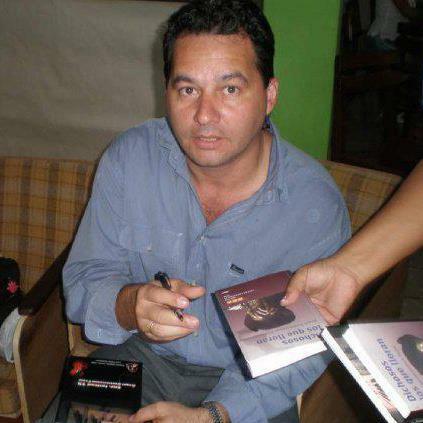 In 2001, after internal pressure from the organizers of the Cuban Book Institute, whose president was the Taliban Iroel Sánchez, it was decided in the office of Iroel Sánchez himself, with a vote of 2 to 1, with the previous winner of the award, the writer Jorge Luis Arzola, communicating via telephone and by giving his vote to my collection of short stories, my book “The Children Nobody Wanted” saw the light of day. Immediately, the War Combatants Association of Cuba (veterans), sent a letter to the Ministry of Culture and the Book Institute itself, for the critical vision of my literature, cataloged the poor management before the Revolution and condemned the actions of those leaders of the culture that allowed it. Iroel Sanchez himself, who was taunted for having participated in the Angolan war, confessed to me that his fellow soldiers criticized him for having allowed, despite it being against their will, the book’s publication. Later, in 2006, also under pressure, when the doctor Laidi Fernández was part of the jury, and at the end she gave her vote, when she realized that there was no point in voting against, it would be 3-2, and that her father, the poet Roberto Fernández Retamar, president of Casa de las Americas, made the comment to Roberto Zurbano, then Director of the Editorial, “my book would remove the foundations of the institution,” the jury awarded me the prize, and the book, despite being published and presented in a small percent of the copies which they delayed for two years, in another attempt to postpone the promotion of the book. Anyway, I regret nothing, something made me guess that it was the right thing, so much censorship against me was the announcement of a literature which was non-conformist and contained an unfriendly vision of officials. These are the fortunes of my “prize-winning” books, and so much anguish has accompanied them, to the same extent that they caused distress to the political and cultural leaders. For many years, more than ten books have slept in my drawer. Sometimes they look through the crack and sigh, waiting for better times, that the darkness would dissipate and the light and the wind would come in and stir the box like signs of progress, as it did recently with a ray of light with the Franz Kafka Prize. Lawton prison settlement. October 2013. Today I heard that the independent journalist Dania Virgen García is being warned by State Security that her constant opposition to the system is disturbing to them. For this, as is their modus operandi, they use criminals, who are themselves, as you can see in the clandestine videos when they abuse the Ladies in White and the opposition in general. First she suffered a freak accident, I remember that I heard it from the prisoner of conscience David Piloto, when I was in that horrible Prison 1580. In the accident she suffered a broken leg. If that weren’t alarming enough, we have to add that when Dania Virgen suffered the “accident” she was with her grandson. We know that State Security doesn’t send warnings for nothing, they continue to escalate, to the point of taking your life if necessary, and if they have entered her home on several occasions, it’s no surprise that in this scene there is a script where Dania Virgen seems to have been murdered by some criminal who flees and is never found. I know it seems like a grade-B movie, but it’s enough to look at what has happened in the last three years with the dissidence, to understand what they’re capable of to stay in power. They know Dania Virgen is stubborn because her denunciations appear everywhere, she is a busy active Human Rights Activist, always attentive to news of abuses and violations and writes them up and circulates them. Her value as an opponent to the dictatorship is vital. A brave and determined woman respected for her decision to fight against the totalitarian regime, she has publicly warned them that she will not think of abandoning the country to save her live, and mentions Laura Pollán, because like her, she warns them, they will have to tear her life from her. An emotional Havana evening, the kind which seals memory with a light of fire, I met the poet Rafael Alcides Pérez (Barrancas, 1933). Choosing to remain anonymous, as is his custom, he was in the audience which was attending the launch of my poem-book Colómbico, being held in the bright room of Havana’s Hotel Inglaterra. I learned he was there almost immediately after I had finished my duties, after signing a few autographs for friends and strangers, when the poet and critic Virgilio López Lemus, who had made the eulogy for my book, came with Alcides and introduced me to him. “It’s a must have for Cuban poetry,” said López Lemus and Alcides smiled indulgently. Silent, hardly daring to comment. His eyes, however, scrutinized every gesture, like his poetry. Born in the eastern town of Barrancas, Alcides moved to Havana to study for his baccalaureate and thence to Havana, where he graduated as an industrial chemist. A nomad since he was young, he traveled to Mexico, USA, Argentina, Chile, Uruguay, Venezuela, writing poems here and there like someone taking photos. 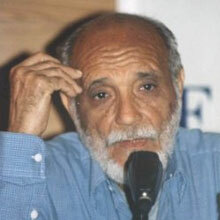 A member of the “fifties generation” — writers born between 1925 and 1945 — affiliated with Cuban revolutionary project headed by Fidel Castro and which sought to banish exploitation and inequality from the island, Rafael Alcides put his literature at the “service” of a nationalist and justice-seeking ideology, writing crystal clear, intimate and clearly understandable verses for the people who shaped his poetry, colloquial, at times choral, other times intimate and questioning, which bears witness to the present and defends the future. During those years of dreams and hope, he worked as a producer, director and writer for radio and unveiled the new conversational, lyrical canon of articles and reviews for the magazines Unión, Casa de las Americas and La Gaceta de Cuba, and on his radio programme, In the place of poetry. So he was recognised as an author of value, who published the poetry books: Mountain Hymns, 1962, The Wooden Leg, 1967. History, however, was in charge of clipping the wings of dreams and the 1970s came with their censures and excesses. After a publishing silence, the lyrical work of Alcides reemerged in the eighties, with poems that speak of a change of themes and approaches, where the poet becomes questioning, doubtful, raising his voice of dissent and seeking answers in epic genre of everyday life. He dares to deal with issues and questions which speak of this “Quixotic soul” for which he is recognized, and that leads him to confront “windmills” knowing that they can throw mud at him, under the indifferent gaze of Sanchificados. The artist decides to retreat and write from the margin. His commitment to justice, sentencing him to be an exile within his own country, which however takes the point of view that a poet is a creature “charged with bearing witness to the present day and announcing it tomorrow”. His writings express the irony of someone who knows that his work doesn’t deny but rather affirms. Grateful like a dog, 1983, And they die, and they return, and they die, 1988, Night in memory, 1989 Nobody, 1993, all carry his rebellious speech, his faith in humanity and his desire for communication, which is also evident in the anthology published in Spain by Renaissance and entitled GMT (Seville, 2009), a compilation of articles written between 1963 and 2008. And with each poem Rafael gallops upon Clavileño, dreaming of a utopian island which his sincere verse and Quixotic attitude have conquered. The writer Ángel Santiesteban Prats will receive a new tribute, this time from the poet Rafael Alcides. State of SATS* will open Cafésatso, a space for literature, conversation and pure coffee. Rafael Alcides will dedicate his presentation to Ángel Santiesteban, wrongly imprisoned by the Castro dictatorship. My mother always warned me that the Cuban government proceeds through their actions: “When they no longer need you, the squash you like a cockroach”. 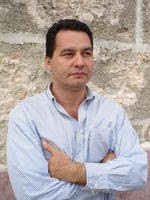 In the cultural media, it is well known that there are very few shows on Cuban TV that do not use Miguel Ginarte to produce their programmes; in fact, very few are those who in the end who are not grateful for his disinterested help, his constant effort, because he takes the care with each show as if it were the final project that he would ever collaborate on. A man who people rarely hear say no, and when he has had to say no it is because it really was beyond his reach to help. But that ranch not only provides work for the The Cuban Institute of Radio and Television (ICRT), but also for the Ministry of Culture, who closed events at that location, like a peasant with a pig being roasted under the stars. I was able to participate in some of these closures before opening my blog, of course, and there we could also see the make up of the diet of then Minister of Culture Abel Prieto, now adviser to President Raul Castro: Fish and wine. At that time, Ginarte wasn’t selling or diverting resources, as he is now being accused of. The television directors, when they wanted their guests to be treated decently, approached Papa Ginarte: who never turned his back, and after giving the respective indications, persevered to make sure that the requests were met. As the actor Alberto Pujol said in his letter, there was no luxury to be found there; on the contrary, everything was very modest, to the point that it looked like somewhere one would film a mambises* cabin in the foothills of a mountain. Ostentation never interested Ginarte, only the quality of his work, because as every good Cuban peasant knows “A bull is tied by his horns, and a man by his words”. As always on the island, behind this web of lies against Ginarte, there must be an official in love with the place, to at a whim do away with the work accomplished by the sweat of another; perhaps someone who resents Ginarte because at some time he should have said no, as only he knows how to do with bureaucrats. But it should come as no surprise to anyone: everyone’s time will come, regardless if they are excellent professionals, altruists, creators, honest, revolutionary people; they need only to be inadequate for the plans of those in power to be literally swept under the carpet. I remember him with his jovial smile of a macho peasant who enjoyed very few days before entering prison. 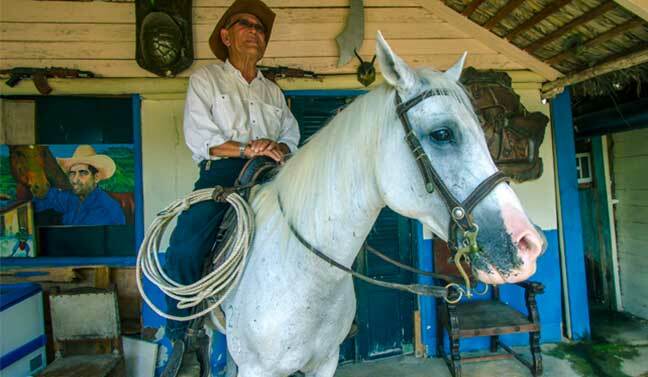 I would like to be able to say to him “the master should be ashamed, Papa Ginarte”, and remember him on his horse, back in the seventies, going to see Luyanó with his daughter Dinae and, patiently, lifting us up one by one to give us each our turn on his beautiful auburn steed. At any rate, despite the pain that the injustice committed against Ginarte has caused us, there is something that makes it worth it, and that is his friends and admirers who have joined him by tooth and nail. I am sure that, as always, those who are ashamed will sign the petition, as they have done for decades. Others will want to do it but their lack of courage, or their commitments or perks, won’t let them; they think that it is not their problem, for now. But when someone does it from their heart, then that is already more than sufficient. *Translator’s notes: Mambises is a term used to refer to independent guerillas who, during the 19th Century in Cuba and the Philippines, fought in the wars of independence. At the close of the Congress of the Journalists Union of Cuba (UPEC), participants highlighted, among the priorities, the need for a journalism consistent with the twenty-first century, with respect to fresh, genuine, direct and illuminating information, which is nothing more than the essence of the work of journalism, its ethics and trade, since its inception; and suddenly it seems to come to the fore as if it has just been discovered: that the correspondent’s only duty is to communicate the truth. Dictators, as we all know, the first thing they do is control information. The Communist Party, from its Department of Ideology and the Council of State, directly owns all the publications, from which they present themselves, manipulating the information in accordance with their interests. They are the owners of the television and newspapers of the country, where they convert Cuban “journalism” into the simple voice of the state, without contradicting the political line drawn by the Government. After more than fifty years of following this uninterrupted practice, it would be very difficult to educate the free press, on the basis of social duty, which should be the only route. It’s a shame that journalists still continue their deception, as they do in addressing the issue of the four Cuban spies convicted in the United States, which they still call “The Five”, and they do not refer to the work of the “Wasp Network”. But, without going into details, as it is not the purpose of this post, I want to deal with the news, and how the pitiful and incomprehensible is that after so much money spent on the campaign to free them, they lied to the people who by their own sweat pay for all the travel of family members, the lawyers and the media paraphernalia. A few months before going to prison, I learned from a book about most notorious spies throughout history, including the Cubans imprisoned in 2001, and the Cuban security spy, Ana Belen Montes, who worked at the Pentagon, which of course is never addressed in the national media but the world knows it. The author let me know the time and courage which he dedicated to the investigations and inquiries. After completion, he presented it to several Cuban publishers, who after showing interest, I am told, also noting that Cuban spies were included, then refused to publish it. It’s obvious that censorship in Cuba is like a sickness, that could only be cured with a political change, to sterilize the evil that has lasted more than half a century. 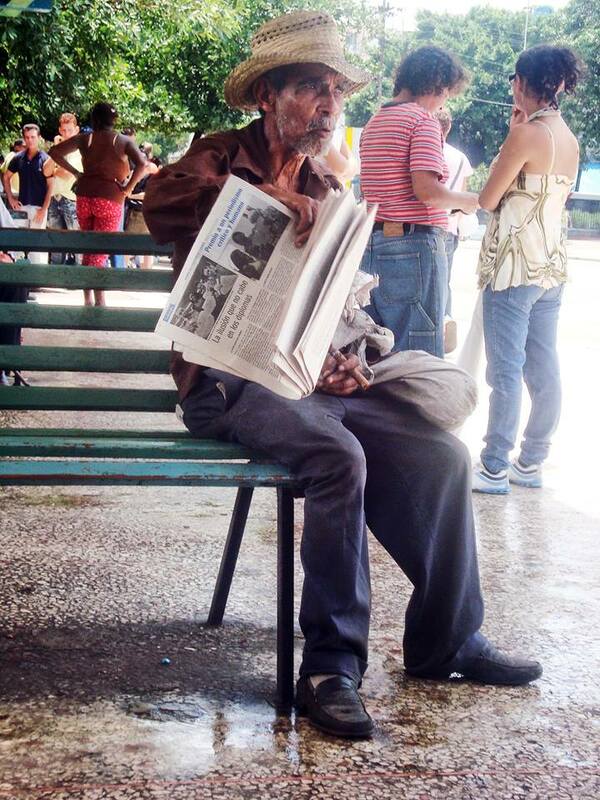 I imagine, when that time comes, the faces of Cubans on learning what has been hidden from them, overshadowing their existence with ignorance. The police fail to understand how he appears at every protest against the government. Like a magician with his best trick, they threaten and laugh at him as they consider him to be a joke. They have still not imprisoned him because they fear that he will die in a dungeon, well, this does not bother him. To him, all worthwhile causes are personal. The latest strategy of the officials is to torment him. They have done a lot but when it comes to Alfredo, it doesn’t work on him. The put him in a patrol car that then takes him as far away as possible from the place where protest is being held. Old Alfredo remains unperturbed and lets them carry out their outrageous act. He simply reminds them on the journey that they are just henchmen and thugs and he tells them what they are worth. They leave him abandoned in some place far from any link with civilization. And yet, he does not complain. He rents a taxi which has been assigned for tourism. Once in the taxi, he directs the driver to Routes 41 and 124, right on the corner of the Military Hospital. Sometimes the driver checks the rearview mirror. The driver tries to get conversation going because, due to his experience as a driver, something smells fishy. But Alfredo only returns a gentle smile. They arrive at the hospital half an hour later. Alfredo leans over to tell the driver of the exact address where he should stop, right at Section 21, the headquarters of Counterintelligence, who were responsible for abandoning him in that inhospitable place. Upon getting out of the taxi, officials run over to eject him. The taxi driver who has understood, lowers his head worriedly. Alfredo, however, presents himself to them. “They will pay you for the fare”, he says as he walks away, shouting “thugs” at them. One year before being cast into the darkness, Sonia Garro and her husband Ramón Muñoz were already suffering the characteristic calamities of Cuban prisons. Starting from twelve months earlier, their daughter crying for her parents, and her waking up — in the early hours, on hearing a random whisper and thinking it was her parents returning — became common, only to tear up on the embrace of her aunt and so back to sleep. Three hundred and sixty-five days of the constant questions, from the reasoning of her adolescence, without them being able to explain, to give her a sensible answer as to why she didn’t have them by her side. The faces of Sonia Garro and her husband Ramón Muñoz, filled spaces in Facebook, and social pressure seemed to be endless, because we knew that the courage they showed made us better people, they taught us to give that little bit that sometimes, out of fear or the simple and natural reflex of safeguarding lives, made us selfish and we therefore did not deliver all the necessary courage; but after their lessons of courage, on March 18 last year, something changed us. A definition disrupted our personalities, and then we were no longer the same, a lightbulb turned on within us and it was the shadow of those two great fighters who, with their example, gave the best lesson of Cubans worthy of their time and their country, giving up their lives, and giving them to a cause in which every child of this island, should be immersed, and they joined their spirits and values to our souls. Sonia and Ramón who have a child to raise, educate, pamper, kiss, now have to settle for memories of when she was small and they took her to school with her little hand getting lost in theirs. Like almost all other people, they want to share a wedding, a house and dreams.They were not prepared to risk their lives, the emotional stability of the family, to not have other urgent missions or diverse utopias to which they could dedicate themselves. Only they thought firstly of their duty to their country, even though to many people this seems ridiculous, archaic even resembling stories from books which describe a bygone era. Some months ago, the Paris-based Cuban writer Zoe Valdés, with her wise, sometimes hurtful but always intelligent style was calling for attention, with good reason, for the people who sacrificed for us, to try to give us a country that we do not have to flee, politically or economically, and therefore they are now suffering for their daring, lost between Coca-Cola and the complete triviality of our times, they were beginning to fall into oblivion and she mentioned those whose names were almost forgotten by time. It came to me as a wake up call to our consciences. Some days after, I was moved by a letter from the Cuban writer Félix Luis Viera, living in Mexico, about the total indifference of Cubans to events on our island (and how well Don Jorge Manach knows how to explain this in his essay of the Joking Cuban), and the lack of solidarity and character with those who have done more and therefore suffer humiliations at the hands of the totalitarian regime. Sonia and Ramón will soon mark one and a half years of unjust incarceration. I ask the best Cubans, who have been born on this tumultuous archipelago, not to silence their voices so that the world may see the government abuse, without the smallest of the judicial guarantees which they have suffered and are suffering. I urge every citizen to not cease in their cry for the freedom of this couple, among the many prisoners of conscience, suffering the punishment of being denied their independence, and the asking themselves the classic question: how long will I be imprisoned? What can be my contribution to reach a decent and uplifting future in my country? Without you, those who are scattered around the world in more secluded spots, the insiders keep us silenced. God put you there to be an echo, the action of the pain those who can’t do it from within the country. That is your responsibility, your way of acting, and we ask for your cooperation, from one sentence to the action of a finger on your computer. I urge my artist friends (what Cuban isn’t an artist?! ), creators, human rights activists, bloggers, journalists, to join this humble but intense call for a just and noble cause. How can one sleep knowing what is happening there? I have no doubt that as long as we remain silent then we are complicit with the dictatorship. As for those who hide behind the word “apolitical”, know that silence is also a way of practising politics. Modestly, I want to dedicate the novel which I am currently working on about the 19th Century, starting at the end of the year 1807, to Sonia and Ramón and in as much as I can capture, in tribute, the pain which blacks suffered, like them, under a slave regime similar to our own today. And if those words were not sufficient for Cuban internet users, I’m kneeling before anyone who has possession of reason and feeling to plead with them for their cry of hope for Sonia Garro and Ramón Muñoz. Lawton prison settlement. September 2013. 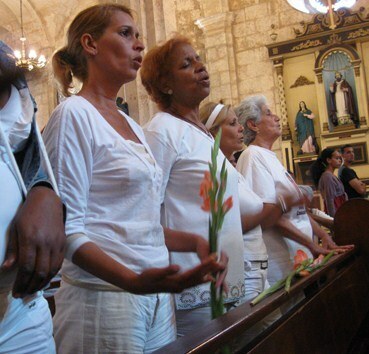 Ángel remains imprisoned in Cuba, make no mistake about it. He continues to hope that his case will be reviewed. However his jailers could not prevent his presence crossing the Atlantic in order to walk freely through the streets, squares, parks and cultural institutions of Berlin. This Friday the 13th, a date which many consider to be a bad omen, Berlin played host to a true act of literary justice. To the intention of the dictatorship to silence the voice of Cuban writer Ángel Santiesteban, the dictatorship received a devastating response: from Thursday afternoon and all day Friday, in different cultural centers of the city where activities were carried out as part of the International Festival of Literature, hundreds of copies of the document, “Short history of injustice”, were distributed, where it explains Ángel’s case to the invited writers, the international media and to the thousands and thousands of Germans and foreigners who attended what is considered the most important Literary Festival in recent years. Thus at 7.30 pm, the main room of the Cervantes Institute was packed with the general public, most of whom were German although the presence of numerous Latin Americans was also noted, all interested in knowing the version of the events which would be offered by the Cuban writers José Manuel Prieto, Jorge Luis Arzola and Amir Valle, moderated by the prestigious German editor Michi Strausfeld. The short introductory words of the Spaniard Francesc Puértolas, Head of Cultural Activities at the Cervantes Institute, made clear reference to the position of this institution to be a plural space where freedom of opinion is respected, regardless of the ideology that that opinion represented. His words were a very brief response to another disrespectful Cuban government maneuver, through the “useful idiots” who are used outside Cuba to try to stop the campaigns denouncing the rottenness of the dictatorship. In this case, the German foundation “Netzwerk Cuba“, which brings together various associations which support the Cuban dictators, wrote an open letter in which it accused the Cervantes Institute of hosting a promotion of culture which was biased in favor of those who were serving the United States in their attacks on Cuba. In one of the paragraphs in the document, where a few historical truths are mixed with a lot of lies, they resorted to the hackneyed accusation that figures like Yoani Sánchez and Amir Valle were following agendas which had been formulated by the U.S. government in their plans against the island. After the editor Michi Strausfeld explained to those present the personal and professional reasons why she had decided to get involved in the defense of Angel, she gave the floor to the writer Amir Valle to explain, in detail, the infamous trial for which Angel is now jailed. Valle began by apologizing to the Cervantes Institute on behalf of himself and his colleagues, because he considered the unfair letter of “Netzwerk Cuba” as offensive and disrespectful; a letter which was blatantly lying by stating that the Institute offered a partial image in favor of the enemies of the “Cuban Revolution” because earlier this year it served as a venue to meet in Berlin with the blogger Yoani Sánchez and now they hosted activity to talk about violations against freedom of expression in Cuba. Valle said that this accusation was contradicted by the simple fact that the Cervantes Institute, on numerous occasions, had hosted Cuban writers and intellectuals who had spoken in favour of the regime, among whom he mentioned the president of UNEAC (Cuban Writers and Artist Union), Miguel Barnet and the recent Cuban National Literature Prize winner, Leonardo Padura. In the heated discussions in the audience at the end of the activity, those present would learn that among others, Cuban writer Nancy Morejon, filmmaker Fernando Perez and artist Arturo Montoto, who have all been praised by the regime, just to mention some of the prominent guests, had been at the Cervantes Institute in recent times. Afterwards, Valle commented that he was there as a colleague, brother and legal and literary representative of Ángel and, step by step, he described the infernal trap in which the political police hounded the writer after which he decided to go public with his criticism of the system prevailing in Cuba through his blog “The Children Nobody Wanted,” and he reminded those present that the document circulated at the Festival could interest them in discovering all the evidence of the wicked deed. Michi Strausfeld later read fragments of a letter sent from Cuba by Ángel and gave the floor to the writer Jorge Luis Arzola, who recounted his personal experience with the Cuban political police and he referenced cases similar to Ánge’s, although much less traumatic, such as what happened to the narrator and poet Francis Sánchez when he also decided to open his own blog, receiving so much pressure and threats against him personally and his family that he decided to give up. Once again, Michi Strasfeld read another letter which allowed the public to know what a day in the life of Ángel as a prisoner of the regime was like. The images described by Ángel, with the same naturalness and visual power which is present in his stories, touched all that were present as they informed Strausfeld, Prieto, Arzola and Valle of such at the end of the activity. José Manuel Prieto later offered his personal vision of his experience as a writer who can travel to the island (something which neither Arzola nor Valle can do, because the regime has already prohibited their entry) and he concentrated his exhibition on the slow changes which were occurring in the aforementioned rigid and monolithic social and governmental structure, among which, the permissibility which the government was demonstrating towards the emergence of alternative spaces for citizen reflection was unthinkable in years gone by and it also ruled in favour of Ángel’s case being reviewed with true justice. To close the evenings events, Valle presented a beautiful edition of the book “The Summer When God Was Sleeping”, with which Ángel Santiesteban recently won the Franz Kafka Novel Competition. Valle, to clarify for those who see any project to support those who oppose the regime as CIA-funded, stressed that this was purely a literary award, organized by an information platform (inCUBAtor) that is supported by the Czech NGO ’Libri Prohibiti’, a civic organization that, among other merits of cultural work, has the largest Samizdat library in Europe. Thus it was like this that Ángel Santiesteban was there, to infuriate his jailers, smiling, with that tranquility of someone who knows that they walk the right path: one of dignity and the defence of his thoughts. Later, while shadows fell over Berlin and the city started its fabulous cultural and social nightlife, he decided take a walk through the streets and walked talking, laughing, remembering the days when they were young and happy and naive, hugging his friends, then and always: Amir Valle and Jorge Luis Arzola. Michi Strausfeld was also laughing at seeing them together, another time, after almost ten years since their last meeting in Cuba. I heard the terrible news that a Lady in White, Iris Perez Aguilera, was savagely beaten. Despite these recurrent allegations of abuse against these women, we will never be able to get used to it, nor have we with that we have seen. These women from the opposition who struggle against the regime like true 21st Century Mambises* are disrespected and abused by those who defend the totalitarian system, particularly national security. As if the beating given to her wasn’t enough, she was then denied hospital access. At the end of last year I also saw, with my own eyes, 15-year-old Berenice Héctor González, who was slashed all over her body and face simply for being related to a Lady in White. She was mercilessly attacked by the daughter of a police officer in the province of Cienfuegos for calling for respect for her aunt who is in opposition to the government. As always, some pro-government bloggers have tried to spin the story that the criminal attack was the result of “blind passion”. Recently, at the beginning of the year, Elsa Rubio Fernández, the daughter of another Woman in White, Mercedes Fernández Fonseca, was assassinated. Elsa did not receive police protection despite the five complaints lodged and the fact that the murderer shouted “that he was killing her and he he wouldn’t have to pay for it because her family were opponents”. I sincerely appeal to the honesty of those eight women** who have raised their voices in defence of women so that they have the decency to show solidarity with these victims of real abuse. Hopefully silence will not be the response of these intellectuals who must now demonstrate their own grandeur and ethics. La Lima prison. March 2013. *Mambises is a term used to refer to independent guerrillas who, during the 19th Century in Cuba and Philippines, fought in the independence wars for Cuba and the Philippines. ** Ángel is referring to eight women, members of UNEAC (Cuban Writers and Artists Union), who signed a letter condemning him for violence against his ex-wife — the trumped up charge for which he was sent to prison. This last 13 September, a Friday, while the Instituto Cervantes de Berlín was presenting my novel “El verano en que Dios dormía” (The Summer God Was Sleeping), the winner of the Czech Republic’s International Franz Kafka Prize of Novels from the Drawer, I was overcome by fever. The dengue fever virus had taken over my body and sapped my strength. While my strength gave way, my mind, in turn, was concerned with defending, as always, that little space of harmony in which, like an inner island, I live and immerse myself, to protect myself from so much injustice and evil coming from the Communist Government. From that imaginary place, I feed myself and construct the events in that distant and endearing country where my friends and brothers await, and where I was close to those excellent intellectuals — Jorge Luis Arzola, José Miguel Prieto, and Amir Valle — and as a panelist, the German editor, cultural maven and person of immense feelings, the imponderable friend and godmother of writers from the “Los Novísimos*” generation, Michi Strausfeld — who is presenting my novel, promoting it, and as if that weren’t enough, making the world aware of the injustice committed against me, and why I am incarcerated. Knowing the work of the Cuban Government, presumably they would elaborate a scathing plan to wreck this cultural space, and they tried to through a public letter from the German “Cuban Network” foundation, accustomed to giving its support to the Castro brothers’ totalitarian regime, a foundation whose right we recognize to do so, however unjust it seems, coincidentally the same right to criticize, expound on reasons, points of view, that we demand for all Cubans, and which for realizing we are punished with impunity, as every dictatorship does against those who reject its designs. The truth is that neither the regime nor illness diminished the joy of feeling myself a physical part of the presentation at the Berlin International Literature Festival. Between the fatigue and high fever, I thought about the book, friends, readers. It is my infinite desire to thank those who have, for several years, supported the competition and brought to light books that the Regime censors, and thanks to this beautiful and just effort, prevented these literary creations from sleeping in drawers; I also thank the Jury who awarded the prize to my novel; and the intellectuals, cultural promoters from different countries, and my friends who put so much effort into this presentation, and above all for their political and social ideals, giving weight to culture, our primary reason for being. And to the Czech NGO “Banned Books,” and their clear cultural management. The novel “The Summer God Was Sleeping,” like the rest of my books, attempts to be a photograph of my time, to give a voice to those testimonies of Cubans who risked and are risking their lives to achieve freedom and rights, and who cross the Strait of Florida, trying to evade the pursuit of the dictatorship, in order to leave behind the material shortages and political repression. On this they wager their most precious possession, their lives. Once again, I try to present my time and our time. I know that’s not enough, I need to double my efforts, and to this I bravely turn my efforts. 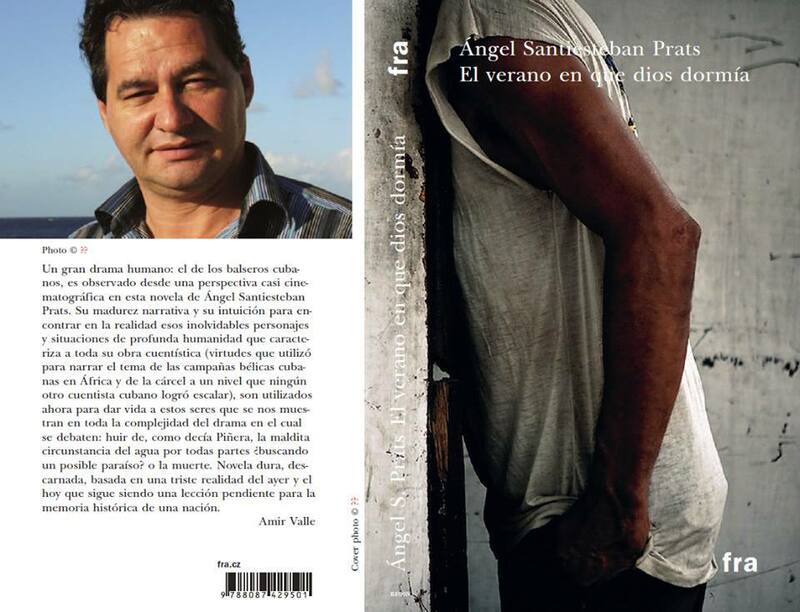 *Translator’s note: “Los Novísimos” (The Newest) is a name that has been given to Cuban writers such as Angel who began to publish in the 1990s — during the so-called “Special Period” — and whose works reject the values of the Castro regime.